Lean Thinking: How Does a Fukushima Culture Evolve? How Does a Fukushima Culture Evolve? That’s how I was taught at TMMC our fine old plant in Cambridge Ontario. But evidently, there’s a very different mental model in nuclear power industry. The past few years I’ve reported the extraordinary story surrounding the nuclear meltdown at three Fukushima reactors in 2011. Well, the truth is finally out. 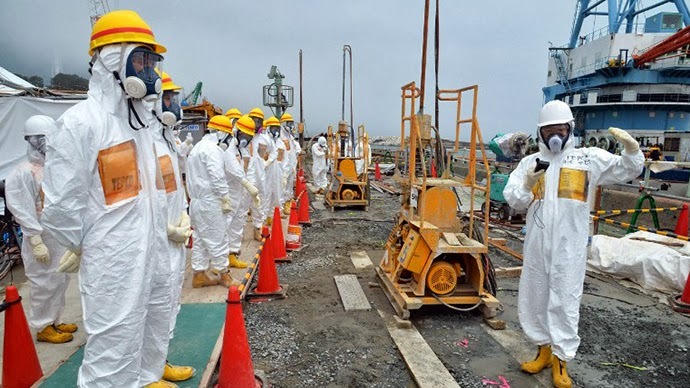 Tokyo Electric Power Co. (TEPPCO) President Naomi Hirose, and senior director Takafumi Anegawa have formally apologized to the people and President of Japan for TEPPCO’s lying about the biggest problem a nuclear power company can have. An investigative report released last Thursday by three company-appointed lawyers said TEPCO's then-president, Masataka Shimizu, instructed officials not to use the phrase ‘meltdown’ under pressure from the prime minister's office, though the investigators found no proof of such pressure. The report said TEPCO officials, who had suggested possible meltdowns, stopped using the description after March 14, 2011, when Shimizu's instruction was delivered to the vice president at the time, Sakae Muto, in a memo at a televised news conference. Shimizu had a company official show Muto his memo and tell him the prime minister's office has banned the specific words. How do such cultures evolve? Operational standards soon follow – front line work, critical safety work (e.g. Lock Out/Tag Out, and Confined Space Entry…), managerial work like team huddles, Leader STW and the like. Before too long everybody is lying. Organizations facing severe competition soon totter & collapse. The examples are too numerous to mention. Eventually, though the termite-infested structure wobbles, then falls down entirely. The shareholders, or in TEPPCO’s case, the Japanese people, are left to pick up the pieces. (The collapse of standards in major institutions has broader societal implications, of course. Standards are our shields, no? They help us distinguish right from wrong, and thus make problems visible, so we can fix them. Visibility, visibility, visibility. We humans are tricky, lazy & dishonest. Monopolies, oligopolies, NGO’s and others lacking public oversight have repeatedly succumbed to hubris’ siren song. Taiichi Ohno, chief architect of the Toyota Production System, went to factory floor every day to go see what was happening, warts and all. Reality keeps us humble and TPS methods at heart are about making problems visible. St. Jerome kept a human skull of his table. How many of leaders have such humility? The best leaders I know try to build a management system and a culture that makes problems visible at each level. Then on a regular basis, they go see what’s there, and help out where they can. We safely assume that Mr. Hirose and his merry band, and their ilk around the world, do no such thing.